A combined passion for cocktails, tea, history and storytelling turned out to be the right combination to win the first Glassology by Libbey competition. Robert Schinkel (Amsterdam, 1974), acclaimed bartender and tea sommelier, and the founder of Pekoe Tea Liqueurs translated more than 25 years of hospitality experience into his winning design. 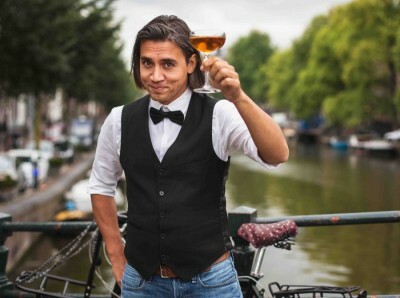 Since age 16 he’s worked in a great range of bars and restaurants in many different roles before starting his own business after winning a global cocktail competition in 2006 (Remy Martin Bartender Style Masters). The following years he developed himself from bar consultant to (global) ambassador and from cocktail bartender to tea specialist. During those years he travelled the world visiting more than 70 countries, training leading hospitality brands like the Marriot Group, IHG, Hilton and the Shangri-La Group and speaking at trade shows, bar shows and food festivals across the globe. His travels gave him unique insights into the world of hospitality and the drinks industry. This finally made him return to the core of his passion, making drinks and creating an experience. Today he’s the proud owner of Pekoe, the first range of true tea liqueurs, mixing his passion for cocktails, tea, history and storytelling once more.